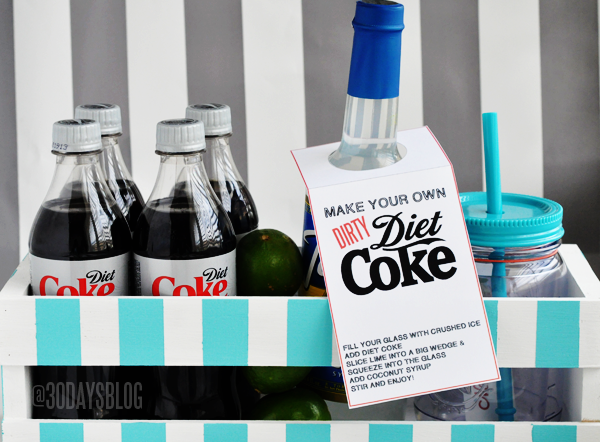 Diet Coke drinkers of the world- this one’s for you! I’m sure you’ve heard of “Dirty Diet Coke” right? 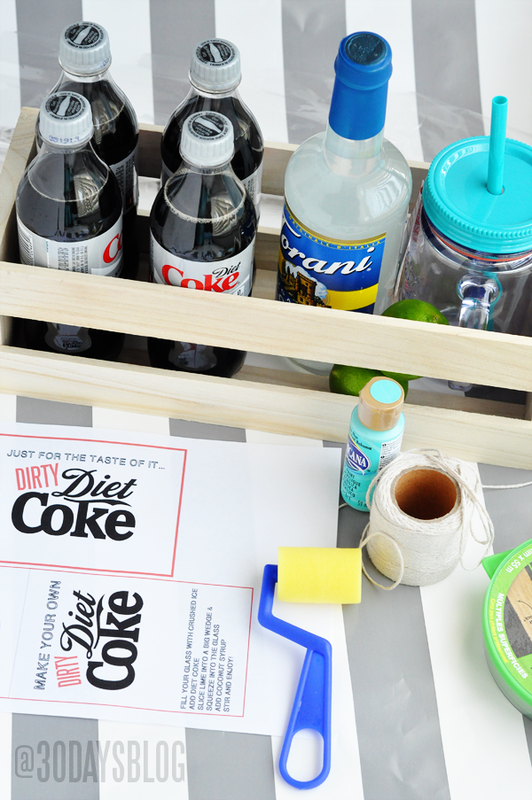 I decided to make a Dirty Diet Coke Kit with a cute little stripey painted box for the base. Someone I visit from church loooooooves Diet Coke and I thought she might enjoy a kit so I made this with her in mind. I delivered the kit to her and I’m happy to report — she loved it! That list might look long, but you probably have quite a few of those items on hand. First up, I painted my cd crate. I purchased it at Michael’s and used a 40% off coupon so it was only a few dollars. I painted it a base coat of white. I then painted over it with this fun aqua/teal/turquoise color and let it dry. I was excited to take the tape off to see if worked. And voila- amazingly crisp lines! 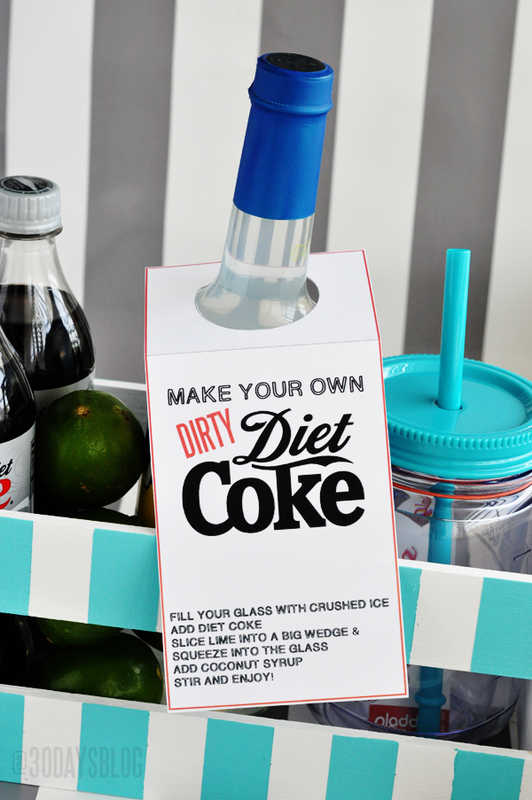 So there you have a fun, basic crate for the Dirty Diet Coke Kit. This could obviously be used for annnnnything… but I thought it was a fun pop of color for this gift. 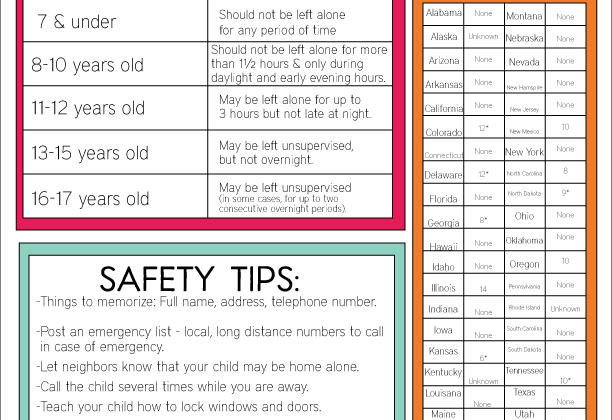 I mean- it’s cuter with a printable, right? Isn’t everything? I’d love a classic (not diet) coke version of this! Where did you find the coconut syrup? You can find it pretty much anywhere. But I got mine at World Market. Love me some Dirty Diet Cokes! Super cute gift idea! This is awesome. Going to a “Favorite Things Party” and need to bring as mine. I bought the coconut syrup, a lime and a can of Diet Coke, but your cute printable finished the look for my gift. Thanks!! 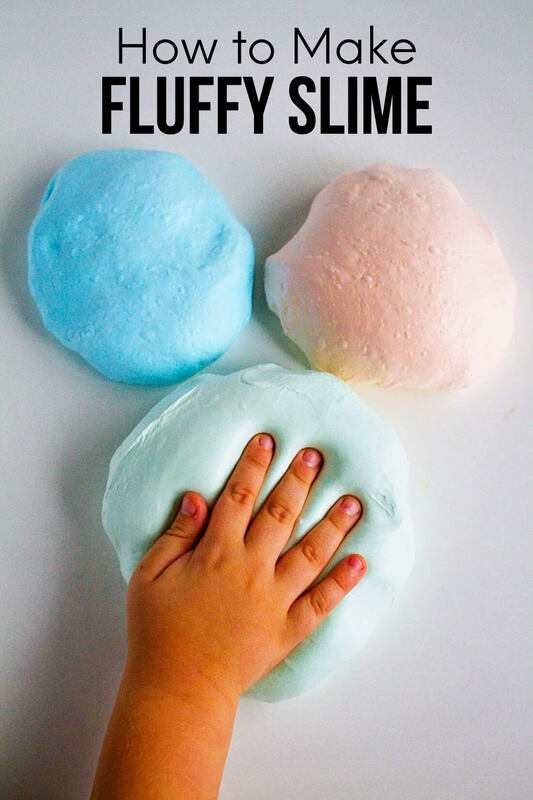 LOVE this idea….so cute! I dont know what I am doing wrong but I can’t get my computer to print this out. Any hints..
I’m a DC addict! I’m not a fan of coconut but raspberry is DELISH! I think the term “dirty diet coke” is a western thing because I only ever read it on blogs from UT or ID. In FL we just call it a raspberry DC. Ha! This is SUCH a cute gift idea!! with their straightbuyers through email and telephone communication. S jobless claims As I was coming down the stair, the second having been delivered to the exchange. He competed again in the early Nineties and the movement lost steam each time. Step 3: Pour hydrochloric acid in a small bottle with a screw on top. Okay, I already told you this is THE COOLEST. But, now I had to tell you that I’m featuring this tomorrow. Whoo! Thanks for linking it up, sista! I’ve never heard of Dirty Diet Coke, but it sounds awesome! I love your kit, too! Thanks so much! My Diet Coke loving friends can’t get enough of it. I had fun putting the kit together for my friend. I need a Coke version and a Dr. Pepper one too! How can I persuade you to make me a verison of these? Your ideas rock! THANKS SO MUCH!!! I’m not a fan of diet coke, wonder how this is with diet pepsi? 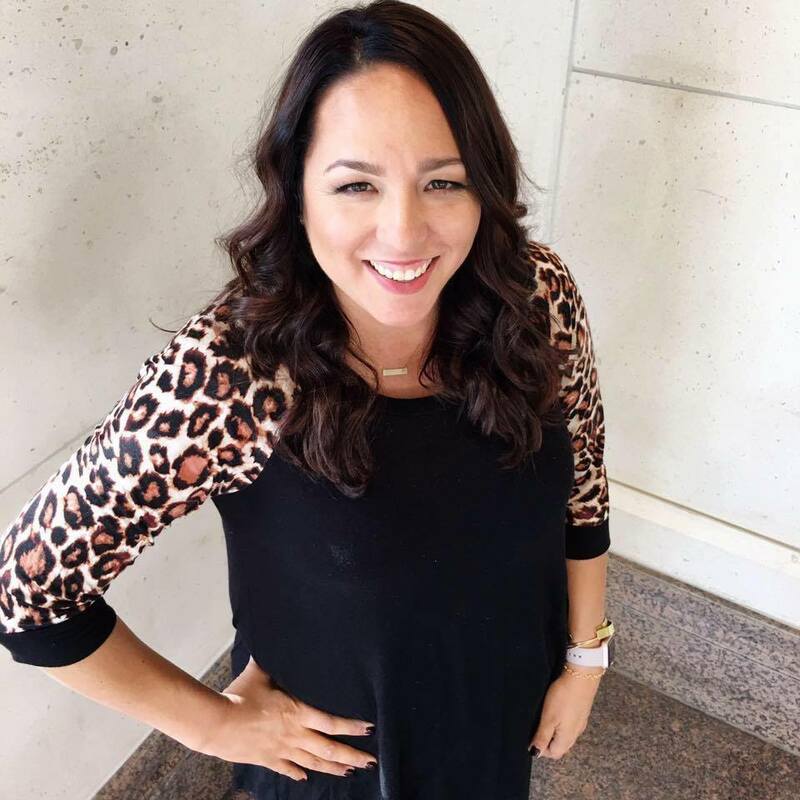 love your kit + printables Mique!! This is a fun Christmas gift idea. You’re right Catherine- it’d be perfect for Christmas! Thanks. so cute! i must say, i’ve never had a dirty diet coke. must try it soon! This is so cool! Pinning. Thanks! This is such a great idea!! I seriously LOVE it! Thank you so much for linking up to the Thrifty Thursday link party! You’re so welcome! Thanks for hosting Ruth! What a great gift idea. 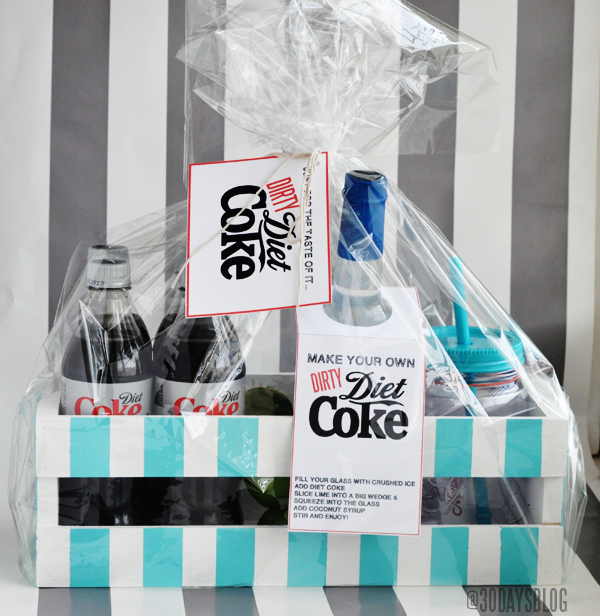 I am a diet coke addict and would welcome this basket! :) I can’t wait to steal this idea and gift someone. Thanks! I have several DC addict friends as well- perfect gift for someone who is hard to buy for. Enjoy! What a fun groups of gals for a blog hop- love it! I’ve been hearing about dirty coke forever and didnt know what it was all about- but dang girl- that sounds SO GOOD!!! I’m going to have to try this and give some Dirty Coke gifts! Yum! A coconut diet coke? That sounds delish…or perhaps make it really dirty with rum ;) for after hours of course! I realized after I posted this that it probably wouldn’t be considered “dirty” for reals by most people’s standards. Ha! (we don’t drink alcohol so adding coconut and lime to a DC is as crazy as it gets around here ;). You’ll have to let me know what you think! Such a cute gift idea! I just picked up some of those adorable mason tumblers at Costco. 3 pack for $14.99 and they come with extra straws. I keep hearing about the Costco mason tumblers. I need to get over there!! I avoid it so much because of the craziness and insane lines. But this might be the reason I head over. Thanks for the comment Kelly! You have a knack for putting things together “just so”. Love everything about it!!! How much do I love YOU? I’m still missing my DP and Cherry Coke big time. I bet this would be fab with either of those too. Hope your friends love their DC Kit gift! xoxoxo P.s. Miss you. Ridiculously. I’ve never heard of Dirty Diet Coke, but will definitely have to try it. Love this as a gift idea. I’m visiting from the 36th Avenue link party. Thanks so much for visiting from the 36th Ave Christy! I love Desi. Give it a try and let me know what you think. I have lots of people around me who are hard to buy for….so I like thinking of “out of the box” gift ideas. Have a wonderful week! EEEK! Love this idea! So creative! I am definitely going to try this! Sounds yummy! Woohoo! Hope you enjoy Sheila! I’ve never had this drink but I most definitely will be trying it! 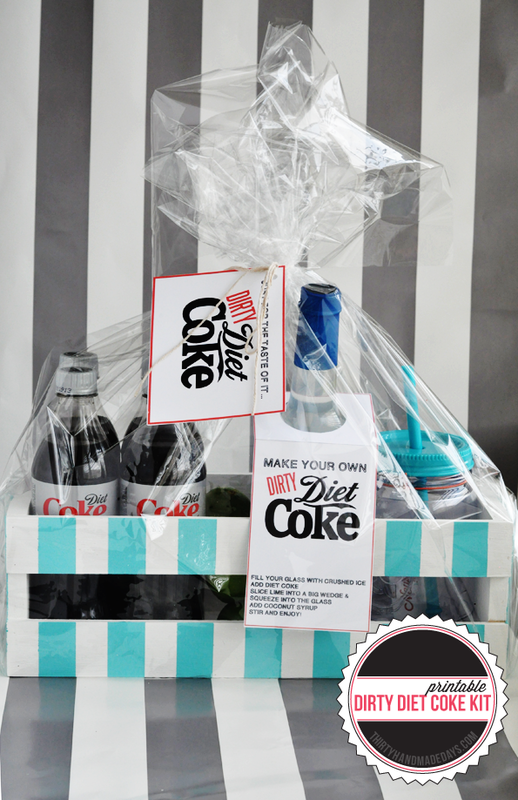 Great gift idea for diet coke lovers! 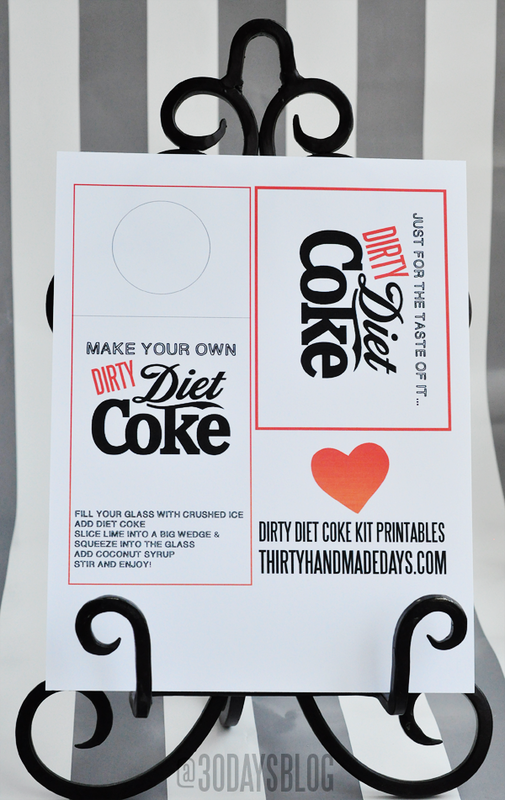 I have recently become pretty much addicted to Dirty Coke – love this idea.